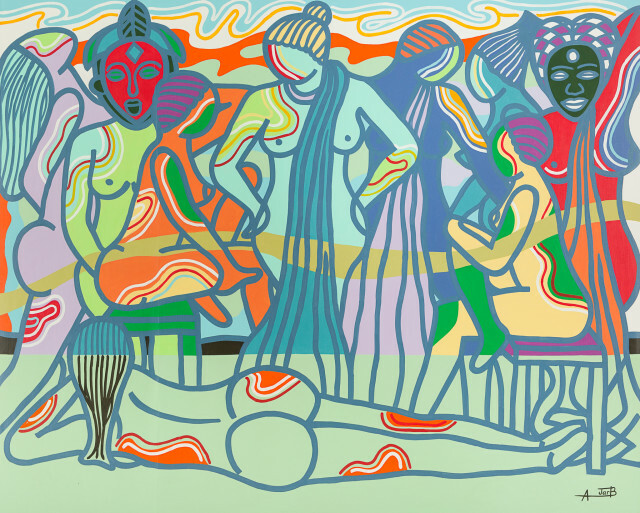 Jack Bell Gallery is pleased to present a new body of paintings by contemporary artist Ajarb Bernard Ategwa. In his second solo exhibition with the gallery, Ategwa continues to deal with hardship on the streets of downtown Douala, Cameroon. While his earlier work focused on a disenchanted young male population, this new series confronts female youths amongst scenes of urban hustling and nighttime prostitution. Cameroon’s largest city, Douala, has had many foreign influences in the past and more recently an influx of migrants from within the country as well as from neighbouring regions. This has shaped Douala into the vibrant and colourful metropolis that is the source of Ategwa's art. His paintings work as sequences in a larger narrative describing the chaos of his hometown. Moving between the taxi stands, newsagents, roadside markets and fleeting moments of respite, the artist offers snapshots of everyday life.